A big topic in my age group is retirement. About half of my friends are looking forward to it while the other half are already there. As for Thom and I, we see ourselves standing with a foot on both sides. We aren’t retired, but neither are we chained to our work. 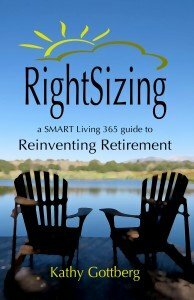 What makes us different from others hoping to retire soon is that we’ve embraced what I call rightsizing. Rightsizing is a process that any of us can do to come into greater alignment with our most cherished values and goals. On a practical level, rightsizing points to actions we can make at any age that will help before, and especially after, a person retires. In case you are wondering, I am not a financial advisor. Most retirement “planning” comes from people who would like to manage your finances. That approach tends to put the focus on how much money you make, how much money saved, and how much you need in the future to maintain your current lifestyle. 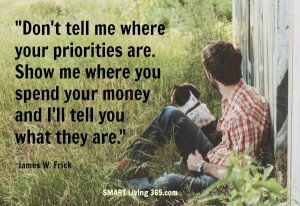 Rightsizing, on the other end, downplays money and instead puts the focus on what is most rewarding in your life. 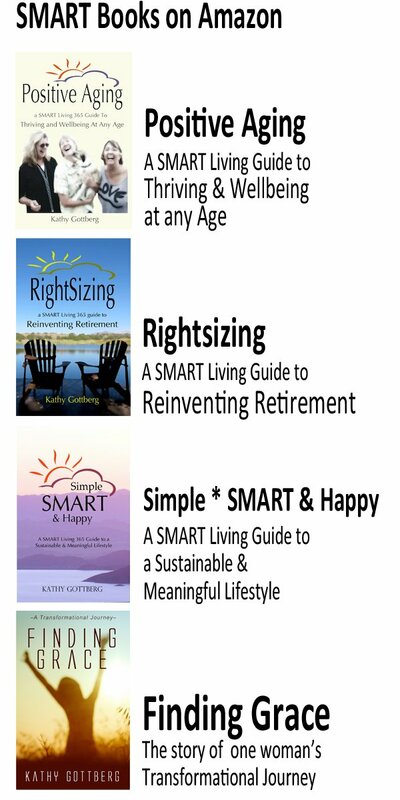 My book, Rightsizing: A SMART Living Guide To Reinventing Retirement, covers this in greater detail. But the simple definition is: “Rightsizing is the ultimate journey to find what matters to each of us. That includes what’s inside ourselves, and then in our homes, our community and the world we inhabit.” In other words, rightsizing is about discovering what give your life meaning, makes you smile, and allows you to sleep well and deeply every single night. If you aren’t there yet, you are a good candidate regardless of whether you are looking to retire soon, or not. 1. The discovery of what matters most and is of greatest value to you and your family. Without a doubt, we are all different. What fills me with wellbeing is likely different than what brings you joy. Unfortunately, lots of people don’t know what that might be because they are so used to grinding it out and going through the motions. If you take away those motions (like going to work five days a week) or take away the influence of what other people think you should be doing, many people aren’t sure. Rightsizing requires that each of us take the time to be clear about what it is that would make us wake up with positive anticipation each day—and then do our best to work toward that fulfillment. Of course, I understand that is also more difficult for some than others. Not all of us start at the same jumping off place so just trying to catch up may be your primary focus. But remember, the more any of us understands our deepest needs, the closer we are to finding and filling them. 2. The elimination of everything else that doesn’t matter or doesn’t bring us joy. Once a person knows what matters most to them, rightsizing suggests we start whittling away at all the other stuff we have allowed to pile up in our lives. Much of that stuff is material items like the status-symbol car we bought and financed in order to impress people at work, or the much-too-big house in a trendy neighborhood because that was an image we once believed was important to project. Letting go of all the unimportant things we “chased” in the past gives us the freedom to embrace new awareness and new possibilities for our future. 3. Finding a home that suits our particular needs, personality, budget, and lifestyle. Lots of people as they approach retirement begin to consider downsizing out of the big family home they have lived in for years. They call it “downsizing” because in many people’s minds it is a sacrificial experience of the life they used to live. On the flip side, rightsizing is a forward motion to a new beneficial lifestyle that embraces the very best of possibility and growth for the future. It matters little what the size is, as long as it fits you easily and matches your current goals, resources, and dreams. 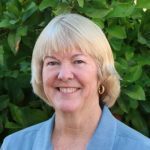 At the same time, I realize that others are just hoping to find and keep a home that feels comfortable, safe and affordable as they retire. Fidelity Investments questioned over 2,000 adults age 55 to 65 about their retirement. They discovered that most pre-retirees are under the impression that the largest expense they will have in retirement is health care. They were wrong. The largest expense is the cost of your housing. Sometimes renting is the perfect answer instead of owing. Rightsizing your home means that you find one that works for you on all levels. 4. Living well within our means. A big part of the stress and unhappiness in most people’s lives comes from managing debt or working at jobs they dislike for long hours to make money to impress people they don’t really know. Most of us need far less than we think we do so when we rightsize and get clear about what really matters to us, living within our means is usually liberating. Instead of attempting to medicate ourselves by buying stuff we don’t need, we spend our time and our money on experiences, those we love, and things that matter. This is a big deal. A report done by the Gerontological Society of America in 2015 tracked pre-retires to see how well they had prepared for eventual retirement. This study reported that nearly 30% of pre-retirees have no retirement plans or accounts and that 60% hold long-term debt. It also reported that nearly 40% of pre-retirees use credit cards expensively—that means they are only making minimum payments, often exceed limits and frequently pay late fees. Up to 43% of those questioned admitted that “I have too much debt right now.” Distressingly, 64% admitted that they would have a difficult time coming up with $2,000 for an emergency. Learning to live within the money available to us is a rightsized way to find wellbeing. 5. Become financially literate. The National Bureau of Economic Research is deeply concerned at the lack of financial literacy in our country. Because it is fairly easy to get a credit card or even open a bank account, people often incorrectly assume they know how to take care of their money. While the emphasis for those hoping to retire in the future is usually on recognizing how much a person might need to retire—perhaps a better focus is on how to manage existing resources in order to live well right now. That’s where rightsizing helps because rather than asking a person to save or invest for the future, it asks us to get clear about money today. The more a person understands how much money they need to support the lifestyle they want to live, now and in the future, the better. Learning what we need to be content and safe is always beneficial. 6. Get in touch with your inner creativity. We are all creative. Unfortunately, most of us have taken on work or projects in life that iron out the creative urge we were born with. Rightsizing gives us permission to embrace that inner creative part of ourselves without judgment. Learn to cook, dance, paint, write, do woodwork or photography, or any one of a hundred things that bring you joy. Much of the time it doesn’t cost a thing yet the rewards are great. 7. Learn to embrace positive aging. Recognizing the aging process as one of continual learning and unfolding possibility is a key to making the most of each and every day. 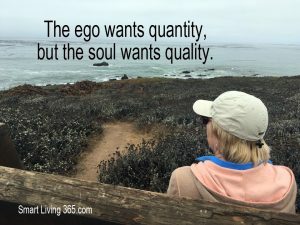 I’m doing my best here on SMART Living 365 to make this an ongoing topic. 9. Stay actively engaged in a healthy diet, level of exercise and overall health. 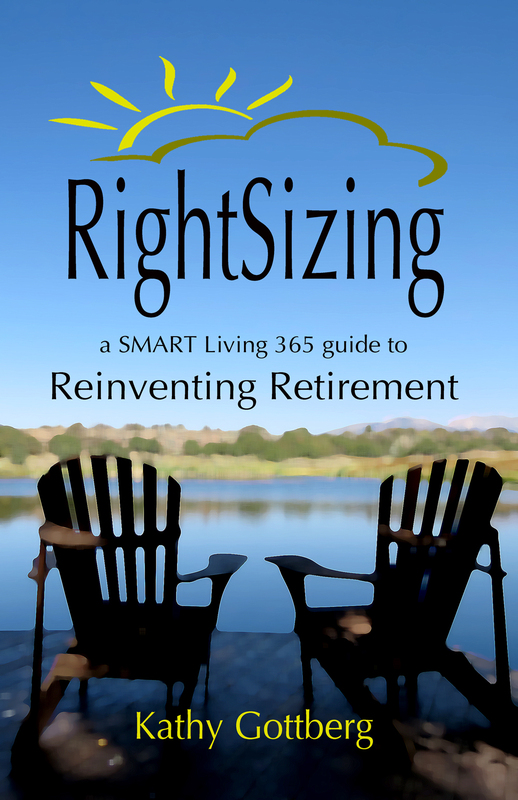 Rightsizing goes far beyond just preparing us financially or materially for retirement. Instead, it reminds us of what is most important so that things like good health and a long life of wellbeing stay equally significant. Just like everyone’s needs and desires are different, there is no one-size-fits-all for optimal health. Just remember to consider your mental, emotional and spiritual lives as much as you do your body. 10. Surround yourself with supportive, healthy and rightsized people. A real key to rightsizing is taking the time to develop positive relationships with those closest to you. Perhaps even more important is recognizing who is detrimental and letting them go. Remember, the more the people around you support your path to rightsizing the easier and more fun it will be. One of the things I love most about rightsizing is that it doesn’t ask me (or anyone) to fit inside another person’s box. There is no one “calculator” that you can put a couple of numbers into and come out with a formula. The path to your rightsized life is unique and only you can come up with the answers. But guaranteed, if you take time to focus on these ideas, you will enrich your life and retirement in more ways that you can imagine. Even better, your “today” will take on more satisfaction and happiness than you might have ever realized. If you are not already on the path, it would be SMART to start today. Retirement is like starting a whole new life! It may be hard letting go of the home your children grew up in, but its one of those situations where you get out what you put in. You worked hard, cash it in and enjoy it! Your wisdom is so timely for me, Kathy. I’m not to retirement age, but can see it far on the horizon. I’m cognizant of the first one–what means the most to me. And am working on # 2: “The elimination of everything else that doesn’t matter or doesn’t bring us joy.” That’s an eye opener, isn’t it! Looks like I’ll be sifting through that one for a while! Hmmm, I commented yesterday but somehow it got lost. Anyway, I was saying that your points are so true, athlo’ my recent experience says they may sometimes conflict. For example, #1, I want a house at the beach; but #4, I can’t afford it! Also, let us remember, downsizing does take some work … to sell a house, buy a new one, move and somehow dispose of a lot of your tings and sometimes store others; do improvements or redecorate the new place; meet and make new friends, new activities. Whew! Maybe retirement is for younger people! Hi Tom! Thanks for leaving a second comment. My old spam blocker was giving me problems so I installed a new one. That might have been part of the problem. I hope it has been fixed!!!! 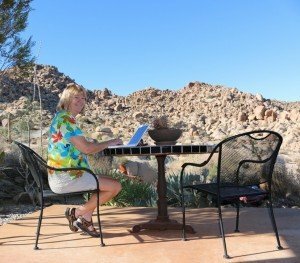 I have been writing about this retirement thing for 10 years. We have been retired for 20. You have hit the nail on the head. I think every section in the article is absolutely dead on perfect. I have always wondered about those people that say they cannot retire because they cannot retire in the lifestyle they have become accustomed to. My answer is always “Don’t do that!” If you cannot live forever in that house then you need to right size right now. It just makes good sense. I love the portions on creativity. My husband and I find such joy in our lives because in order to be where we are today, we had to be creative. It has been such fun. Excellent points Kathy! The calculator comment made me laugh. We used to have a financial advisor who worked his calculator and told me I could not afford to work only part time. This was after I had breast cancer and realized that I wanted and needed more time to heal and ‘Right Size” my life. I told him to rework his numbers. He still “calculated” that I needed to work 4 more years before I could cut back to part time. I fired him, changed companies, started working part time and then started my own company!Sure there were challenges at first and adjustments but I never felt it was a mistake! More great ideas Kathy. Making healthy choices and creating our own “right-sized” life is essential. I can just say, “No, I don’t want to do that, but I do want to do this fun, fulfilling thing.” I recently went through a few things and HAD to make some rightsized changes and now am so much better because of it! Thanks much! 10 reasons to rightsize is a reminder that life management is a continuous process. I still maintain that retirement is not for the faint hearted. There is a huge responsibility to manage the time that comes with retirement when formal work is removed from the picture, to do time so time doesn’t do you. The grand essentials of happiness are something to do, something to love and something to hope for (A. K. Chalmers). Rightsizing speaks to this. Given that surrounding yourself w/ supportive others is one criteria for rightsizing in retirement, how and in what ways might “supportive” include family members when we know children, perhaps grandchildren, now live with parents/grandparents? As a result of family breakup, I bought a house so my son and grandson could move in with me and achieve a sense of stability as their family lives shifted. Over a six year period, my son moved in and out of my house five times; other son moved in; son, grandson and I lived in this house; grandson moved out. Shifty business for sure! Hi Yvonne! I think you are asking one of the most challenging questions possible (thanks!) While I won’t pretend that I can answer the question for you–it really does come down to you–I will say in my own family that I have had to draw the line between doing things because “I think I have to because that’s just what people do” and also doing things to “please” others when any of those actions were out of alignment with what is good for me and my future. Then if you throw in the thought that in order to be good, kind or compassionate that we have to sacrifice our own needs to provide for others and it is REALLY had to know what to do next. But two things come to mind for me. #1 Remember on the safety reminders on airplanes ALWAYS say, “put the oxygen masks on yourself first before you ever attempt to help another.” The second thing is something that Abraham-Hicks says repeatedly. That is, “You can never get sick enough to help a sick person get well, you can never get unhappy enough to make an unhappy person happy, and you can’t get poor enough to make a poor person feel abundant.” What both of those say to me, is that we must find our own boundaries around we want–and we must be willing to put ourselves first or at least cover our own needs before others. Of all of the topics you cover in this article, two resonate with me the most—living within our means, and developing inner creativity. They are intrinsically related, since you can’t be creative if you are worried about your financial well-being. In my own case, I couldn’t explore my creativity until I settled some pressing financials issues after I retired. Once I did that, I felt a wave of freedom, and didn’t look back!